Monthly updates from the Yellowstone Volcano Observatory (YVO) summarize seismic activity (table 1) and ground deformation at Yellowstone caldera. Earthquake activity remained at low levels during the majority of the reporting interval (November 2006 through February 2010). There were several earthquake swarms during this time, including significant events in December 2008-January 2009 and January-February 2010. The early 2010 events comprised the second largest earthquake swarm recorded at Yellowstone, second only to the fall 1985 swarm (BGVN 17:03). The swarm that began in December 2008 was the third largest swarm recorded. Table 1. Seismic data for Yellowstone organized by month, including the number of recorded earthquakes, the largest magnitude recorded, and earthquake swarm information. Note the large swarms during December 2008-January 2009 and during January-February 2010. Data courtesy of the USGS. Earthquake swarm, December 2008-January 2009. An earthquake swarm from 26 December 2008 to 5 January 2009 was centered beneath the N end of Yellowstone Lake. The event consisted of ~ 900 earthquakes with magnitudes ranging up to 3.9; 19 events had magnitudes greater than 3.0, while 141 had magnitudes between 2.0 and 2.9. Earthquake swarm, January-February 2010. The January-February 2010 earthquake swarm was centered about 16 km NW of Old Faithful, on the NW edge of the caldera. The event began with a few small earthquakes on 15 January and began to intensify on 17 January. A 3.7 magnitude earthquake was recorded at 2301 on 20 January, followed by a magnitude 3.8 event at 2316. The events were felt throughout the park and surrounding communities in Wyoming, Montana, and Idaho. By 25 February, YVO had recorded a total of 1,809 earthquakes, with 14 reaching magnitudes of over 3.0 and 136 with magnitudes between 2.0 and 2.9. By the end of February activity had returned to background levels. The University of Utah Seismology Research Group stated that the total seismic energy released by all the earthquakes in this swarm corresponded to one earthquake with an approximate magnitude of 4.4. YVO emphasized that while this was an unusually large event, it did not indicate premonitory volcanic or hydrothermal activity. Rather, the swarm earthquakes were likely the result of slip on pre-existing faults. Information Contacts: Yellowstone Volcano Observatory, U.S. Geological Survey, 345 Middlefield Road, Menlo Park, CA 94025, USA (URL: http://volcanoes.usgs.gov/yvo/). The Global Volcanism Program has no Weekly Reports available for Yellowstone. The following is from Roderick Hutchinson. 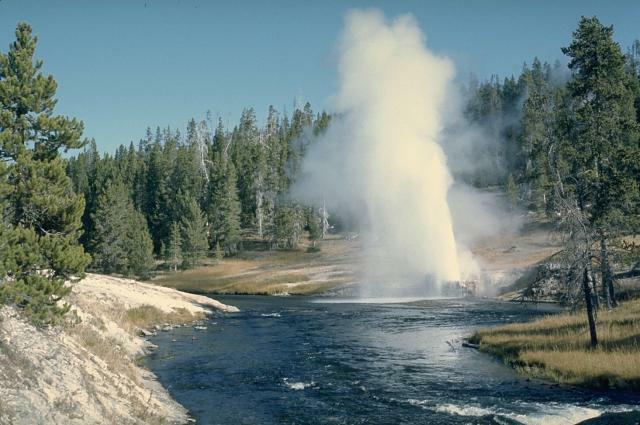 "At approximately 1440 on 5 September, Porkchop Geyser in the Norris Geyser Basin (roughly 44.7°N, 110.7°W) of Yellowstone National Park was destroyed by a shallow steam explosion. Eight visitors witnessed its water-steam mixture eruption column reach an estimated height of 20-30 m from its normal 6-9 m shortly before the whole siliceous sinter formation suddenly blew up. In 'just a few seconds' it threw sinter blocks out in a fan-like manner, mainly to the N and S, rupturing the geyser's vent, hot water basin, and surrounding sinter sheet platform. Maximum range of ejecta was 66.1 m S, 43.4 m N, 31.5 m W, and only 25.6 m E toward the boardwalk. An ejecta rim 1-1.4 m high, 13.9 m long on a N-S axis, and 11.7 m wide was formed around a newly created boiling spring. Much of its volume consisted of large sheets or plates of moderate to dense siliceous sinter buckled loose from the floor of the thermal basin and thrust vertically or overturned. The largest sinter block cast out had dimensions of 1.88 x 1.23 x 0.75 m. Within the ejecta rim, a new hot spring, supersaturated with silica, has emerged and is currently 5.5 x 4.0 m across and 3.23 m deep. "Porkchop Geyser was a small unnamed spring, notable at least as early as 1927, because of its exceptionally high contents of Cl and SiO2; it remained unnamed until 1961, when it was informally called Dr. More's Porkchop by Donald E. White of the USGS, and later shortened to Porkchop Geyser. The name was derived from the shape of the geyser's pool. Porkchop normally had a slightly surging non-opalescent discharge; rarely, a geyser eruption 3-5 m high emptied its pool. Beginning in late Mar 1985, it started erupting as a perpetual spouter from an empty crater through its 2'3.5 cm triangular vent. Over the last 4 years, the geyser's eruption column was of sufficient velocity to be atomized into a fine spray that during winter formed ice cones > 7 m high and produced an eruption roar audible up to 2 km away. "The destruction of Porkchop Geyser coincided with and was probably triggered by an annual widespread thermal disturbance in the Norris Geyser Basin. These hydrothermal events are characterized by briefly increased water and gas discharge, increased turbidity, extreme fluctuations in surface temperatures, alteration of geyser eruptive patterns, and in some years also include the creation of new thermal features. These disturbances have been observed nearly every year since 1971 when more detailed record keeping began." Further References. Dzurisin, D., and Yamashita, K., 1987, Vertical surface displacements at Yellowstone Caldera, Wyoming, 1976-1986: JGR, v. 92, p. 13,753-13,766. Smith, R.B., Reilinger, R., Meertens, C., Hollis, J., Holdahl, S., Dzurisin, D., Gross, W., and Klingele, E., 1989, What's moving at Yellowstone? ; the 1987 crustal deformation survey from GPS, leveling, precision gravity, and trilateration: EOS, v. 70, p. 113, 119, 123-125. Information Contacts: Roderick A. Hutchinson, Yellowstone National Park. In 1985, a new superheated fumarole formed on the upper E margin of the Mushpots thermal area, which lies on the E side of the caldera associated with the youngest of Yellowstone's three cycles of voluminous rhyolitic volcanism, 0.6 million years ago. The presence of vegetation and the limited extent of bare thermal ground indicated that heat flow near the site of the new fumarole had been moderate to low for at least the previous 15 years. Interviews with park personnel strongly suggested that activity began about 3 July 1985. The steam cloud from the vent may have inspired a false report of smoke from the area, but the vent was not discovered until 5 October 1986, during fieldwork by C. Craig-Hunter and Roderick Hutchinson. At that time, the fumarole's transparent dry-steam jet was directed upslope N35°W at an approximate angle of 21°. A small, reddish-brown, iron-stained cone of hydrothermally altered sand-sized material had grown ~ 0.5 m above the uphill side of the rectangular 1.35 x 1.9-m vent, which dipped at an angle under the lower S rim. Just below the fumarole, on the floor of an old thermal zone, were numerous new or recently enlarged, small, steaming, thermal and mud pot vents, covering an area ~ 10 m in diameter. Sulfate and/or yellow elemental sulfur deposits covered most of the area and nearby slopes to the W, SW, and NW. A second area of new or rejuvenated thermal vents was also discovered in the drainage to the south. Many trees had been killed in line with the fumarole's directed plume and around the margins of the old thermal zone. Mature trees as much as 87 cm in diameter were snapped off at ground level or uprooted, and tops were broken on other trees 40 m from the rim of the old thermal zone (54 m from the fumarole). A narrow zone of hydrothermally altered white chips of glacial till was found among the toppled trees up to 40 m from the thermal zone rim. These ejecta were 6 cm deep on the rim in 1986. Geologists returned on 12 February 1987, after a nearby Univ of Utah seismograph . . . detected an isolated episode resembling volcanic tremor. The fumarole's temperature had increased (figure 1) and more elemental sulfur and iron sulfates had been deposited in the old thermal zone, but no other changes were evident. Since then, a biannual survey has been conducted in the area. Figure 1. Temperatures measured at Mushpot Fumarole, Yellowstone National Park, 5 October 1986-28 March 1992. Courtesy of R. Hutchinson. During fieldwork on 28 March 1992, a quiet cloud of wet, 93°C vapor filled the 1985 fumarole's vent. However, less than 30 m downslope (S), on the E margin of the old thermal zone's floor, the ground was shaking violently with the formation and growth of a new mud pot. Bursts of thick, viscous mud were typically doming to 2 m and occasionally to 5 m in diameter before exploding to 3-6 m height. Each explosion shook the ground in all directions. Branches of thermally killed trees shook 50 m away, the ground was visibly moving 8-10 m from the rim, and within 4 m of the rim was behaving like pudding, with violent shaking causing surface oscillations of 1-2 cm. During 90 minutes of observations, the surface area of the mud pot increased by ~ 50%, to an estimated 11 x 7 m. It had a depth of at least 2 m. The minimal amount of ejected mud surrounding the crater and the intense shaking suggested that development of the mud pot had begun within the last 24 hours. On the SW flank of Sour Creek resurgent dome W of Astringent Creek in the 0.6 Ma Yellowstone caldera, is an extensive, unnamed acid sulfate hydrothermal system (figures 2 and 3). Surface expression of the ~3 km2 thermal area consists of discontinuous high temperature altered ground, turbid springs, pools, seeps, fumaroles, mud pots, a large gas- and sulfur-rich acid lake, and numerous sublimated sulfur mound deposits interspersed among low-temperature forest-covered ground. Figure 2. Index map of the western United States showing the location of Yellowstone Caldera. Figure 3. Sketch map of Yellowstone Caldera indicating the location of the recent thermal features described in this and an earlier report. During early 1990, a significant rise in temperature in the upper NW end of the hydrothermal system began killing old-growth pine trees. Within a year, a new super-heated fumarole emerged, blanketing the downed trees and roots with a layer of hydrothermally altered coarse sand from a directed blast to the N.
The temperature and volume of dry steam venting from the deep "shaft-like" vent steadily increased over the next three years, with the temperature reaching a maximum of 104.3°C on 8 October 1994, ~11°C higher than the local boiling point. The dynamic activity of the fumarole and surrounding hot ground was only monitored about twice a year over the three years following its 1990 inception due to its remote location and restricted access. A similar progression was previously seen during 1985 in an area ~4.5 km to the E. This area, the upper E margin of the Mushpots thermal area, sits on the W flanks of Pelican Cone (BGVN 17:03). The progression went from new hot ground and dying mature forests, to the vigorous breakout of a dry, super-heated fumarole with progressively hotter temperatures over time, followed by sudden emergence of a large and violent mud volcano. Both the 1985 and recent thermal features had similar fluid compositions. During 1992-94 the unnamed thermal area W of Astringent Creek developed a series of seven large craters that evolved as the Mushpots thermal area did in 1985. The craters were progressively younger towards the SW, ending at the site of the current new hot ground and fumarole (figure 4). 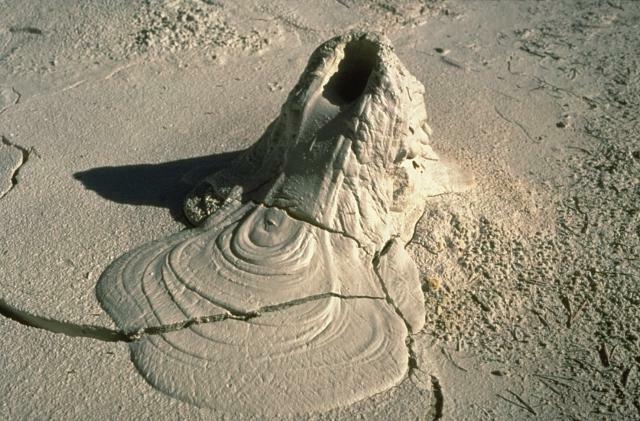 In December 1993, National Park Service research geologist R. Hutchinson predicted that the newest superheated fumarole would soon evolve into a large mud volcano. Figure 4. Sketch map (scale approximate) showing the surface expression of an unnamed thermal area W of Astringent Creek in Yellowstone Caldera. Coordinates for map's center are at about 44°38'06"N, 110°16'44"W. Courtesy of R. Hutchinson. As a part of routine monitoring, the thermal area W of Astringent Creek was inspected on 7 June 1995. The former 104.3°C fumarole was replaced by a large vigorous mud pot with ejecta extensively scattered around it. In addition, two new smaller roaring fumaroles at or slightly above boiling point, three new moderate-sized churning caldrons (pits containing hot, agitated aqueous fluids), numerous smaller muddy pools, collapse pits, and frying-pan springs (audibly degassing springs) were apparent then. Extensive areas of unstable quicksand-like saturated ground made up of scalding mud were found under the fallen trees. Some regions were heavily encrusted with sulfate minerals or sulfur crystals; others were covered by baked organic matter on the pine forest's floor. Extending NW from the largest parasitic churning caldron, below the new mud volcano crater, was a spectacular white kaoline clay mud flow (figure 4, dark shading and arrow showing flow direction). It spread rapidly to reach an average width of 13.8 m in the first 55 meters of its length in dead forest grove and eventually terminated 114 m from its source on the open, acid thermal-basin floor. The relative freshness of the ejected mud and incorporated semi-coarse sandy material indicated that the super-heated fumarole transformed into the powerful mud volcano between mid-April and mid-May. The distribution of large mud bombs suggested that their trajectories reached 20-30 m above the crater rim. Ejecta were seen along the following compass bearings with the stated maximum distances from the crater: N, 13.6 m; E, 30.2 m; S, 25.4 m; and W, 12.1 m.
When visited on both 7 June and 9 September, the mud volcano still continued to throw mud 0.5-1.5 m high from dozens of points around the crater floor. The mud volcano crater was 13.5-m long, 11.3-m wide, and 3.9-4.9 m deep. A conservative estimate of the crater volume was 315 m3. The total area covered by the ejecta and crater was ~2,100 m2. In the SW quarter of the crater a large, slightly elevated projection was visible with an arcuate line of dry, white, probably super-heated fumarole vents. The largest parasitic caldron had numerous points of ebullition in its irregularly shaped pool (maximum dimensions of 10.8 x 7.9 m), with a water level 0.7-1.4 m below the former forest floor. The churning water was near boiling, opaque, light tan in color, and partially covered with brown organic-rich foam derived from cooked plant material. Each of the caldrons were interpreted as being parasitic to the mud volcano crater because they appeared to have evolved shortly after the initial fumarole collapse and then subsequently drained much of its fluids. This relationship seems to have rapidly lowered the crater floor, preventing the accumulation of a thick ejecta cone on the crater rim. The mud volcano crater, parasitic features, vents, and the associated hot ground remain extremely dangerous and unstable. Additional alterations in the creation of new or enlarged springs, and perhaps even another mud volcano crater are anticipated. With respect to geologic hazards, the acid sulfate thermal area should be checked again in the near future. Photographs were taken on 7 June. The Yellowstone Plateau volcanic field developed through three volcanic cycles spanning two million years and included some of the world's largest known eruptions. Eruption of the > 2,500 km3 Huckleberry Ridge Tuff ~2.1 million years ago (Ma) created a caldera more than 75 km long. The Mesa Falls Tuff erupted around 1.3 Ma, forming the 25-km-wide Island Park Caldera at the first caldera's W end. A 0.6 Ma eruption deposited the 1,000 km3 Lava Creek Tuff and associated caldera collapse created the rest of the present 45 x 75 km caldera (figure 3). Resurgent doming then occurred; voluminous (1,000 km3) intercaldera rhyolitic lava flows were erupted between 150,000 and 70,000 years ago. 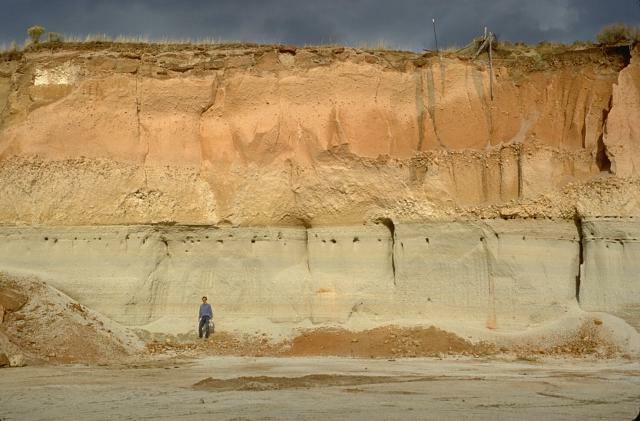 Phreatic eruptions produced local tephra layers during the early Holocene. Distinctive geysers, mud pots, hot springs, and other hydrothermal features within Yellowstone caldera helped lead to the establishment of the National Park in 1872. Information Contacts: Roderick A. Hutchinson, National Park Service, P.O. Box 168, Yellowstone National Park, Wyoming 82190, USA. A series of earthquake swarms began along the NW edge of Yellowstone National Park on the evening of 13 June 1999. Between 13 and 22 June over 630 earthquakes were recorded in a region ~13 km NE of the town of West Yellowstone, Montana and ~5 km SE of Grayling Creek Junction, Montana. The largest of the earthquakes, M 3.5, occurred at 1038 on 16 June. No residents reported noticing the earthquakes. The activity was located along mapped faults that extend eastward from the S end of 1959 Hebgen Lake rupture (the 7.5 magnitude Hebgen Lake earthquake was the largest in the history of the Intermountain region). Earthquake swarms are common in Yellowstone, but this was the largest since June 1997. That swarm also occurred along the NW edge of the park, the area that historically records the most persistent swarms. The most extensive recorded earthquake swarm occurred ~10 km SE of the June activity over a period of several months in 1985 and 1986. Seismicity in the Yellowstone region is recorded by 22 University of Utah Seismograph Stations and two Global Positioning System stations. The telemetered surveillance system provides coverage for both earthquakes and ground movement related to volcanic or earthquake activity. The project is conducted cooperatively with the U.S. Geological Survey Volcano Hazards Program and the National Park Service. As discussed by Robert B. Smith on his web pages at the University of Utah, Yellowstone National Park is located on a hotspot within the North American Plate; its three calderas are the most recent in a string that extends to the SW across Idaho. Dubbed "The Restless Giant" for its geological instability, Yellowstone could one day have another major eruption like the one that formed its youngest caldera 600,000 years ago. Symptoms include numerous earthquakes (most too small to be felt), uplift and subsidence of the ground surface, and persistent hydrothermal activity. The current rates of seismicity, ground deformation, and hydrothermal activity at Yellowstone, although high by most geologic standards, are probably typical of long time periods between eruptions and therefore not a reason for immediate concern. Scientists from the U.S. Geological Survey and the University of Utah are studying the Yellowstone region to assess the potential hazards from future earthquakes and eruptions and to provide warning if the current level of unrest should intensify. Information Contacts: U.S. Geological Survey, Cascades Volcano Observatory, 5400 MacArthur Blvd., Vancouver, WA 98661 USA (URL: https://volcanoes.usgs.gov/observatories/cvo/); Michael Finley, Tom Deutch, and Anne Deutch, National Park Service, P.O. Box 168, Yellowstone, WY 82190 USA (URL: https://www.nps.gov/yell/); Robert B. Smith, Department of Geology and Geophysics, 135 S. 1460 East, Room 702, University of Utah, Salt Lake City, UT 84112 USA. 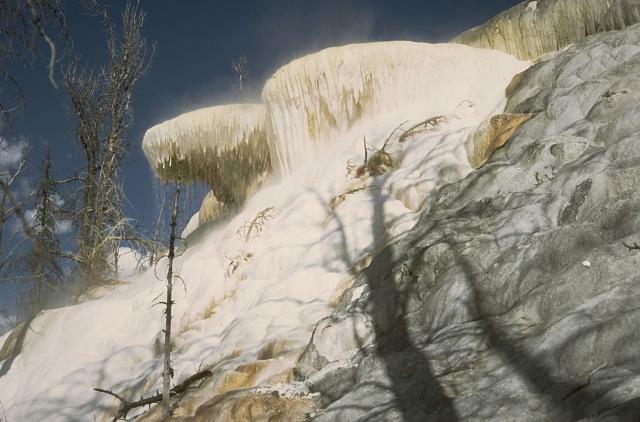 Yellowstone's Norris basin (White and others, 1988) includes the powerful but erratic Steamboat geyser. Steamboat suddenly ejected a vigorous plume of boiling water and steam on the morning of 2 May 2000. For 9 years prior to this-since 2 October 1991-it ejected only modest water discharges to heights under 20 m. This report discusses the basic observations surrounding the outburst, the minimum volume of the water discharged, and some collateral changes seen at neighboring Cistern Spring. Shaken campers. Around 0700, National Park Service (NPS) employee Bob Lindstrom stopped at Norris to investigate an anomalously tall vapor column. Two park visitors, who had spent the night sleeping in their camper pickup truck in the otherwise deserted Norris parking area (figure 5), told him that they were abruptly awakened about 0500. The campers had felt the ground trembling as their truck started rocking, an effect they mistook for an earthquake. Frightened, they initially drove away, but upon looking back they saw a huge vapor plume and returned to Norris. Figure 5. A map of Yellowstone's Norris basin showing the location of Steamboat and Echinus geysers, and Cistern Spring. The map also illustrates the parking lot where the campers spent the night of 1-2 May 2000, and the location of the instrumented weir used to estimate the runoff from Steamboat geyser's abnormally large discharge on 2 May. The map was provided by the Spatial Analysis Center, Yellowstone National Park. By 0700 when Lindstrom arrived, a wet mist enveloped most of the area around Steamboat geyser; it appeared as local rainfall, even though elsewhere the sky remained blue. The subfreezing air temperature caused ice to form where water fell on the boardwalks running out to the geysers. Discharging steam emitted a jet-engine-like roar. Steamboat was in full steam phase, with a vapor plume then approximately 150 m tall. Although the campers took early photos not yet available to the Park, other photos were taken during the steam phase of the outburst (figure 6). The loud roaring associated with the steam phase continued unabated through at least 0800 and other sources said noises remained audible at 1100 on 2 May. According to Paul Strasser, the outburst left rocks and sand on atop the bridge over the eastern runoff channel at the base of the hill. Figure 6. A photo showing the steam-dominated secondary phase of the large 2 May discharge from Yellowstone's Steamboat geyser. More photos of the steam phase are available at the web site given below. The exact time of the photo and the location of the photographer remain unreported. National Park Service photo by Tom Cawley. Water runoff. To study changes in the Norris basin, for the past 12 years Irving Friedman has monitored the output of a small creek that drains the basin, ~2 km from Steamboat and Echinus geysers (Tantalus creek, figure 5). His efforts have been substantively aided by NPS support and collaboration in addition to help from a cadre of volunteers. Tantalus creek's discharge gets measured at a small dam with a notch of known dimension (a weir). The height of the water passing through the weir relates to the stream discharge. The water height gets measured by a float gauge similar to those in automobile fuel tanks. The float's position gets recorded every 10 minutes by a data logger. The 10-minute sampling rate means that the instrumentation can only be expected to reflect behavior with periods over 20 minutes; signal processing theory suggests shorter processes can be aliased (i.e., biased leading to misleading results). Since each of the outburst's two phases each lasted over an hour, the sampling interval appears to have been adequate to describe the two phases. As shown on figure 7, the 1 and 2 May weir data show runoff changing in a long-period cycle somewhat over 20 hours in length, with the Steamboat peak on 2 May superimposed on or near the peak of this long-period cycle. Similar long-period runoff cycles occur often in the weir data, but their cause has not been identified. Figure 7. A plot showing the time-series of water discharge from Yellowstone's Norris basin on 1 and 2 May as measured at the weir. The position of the weir's float gauge was recorded every 10 minutes. Courtesy of Irving Friedman. The weir data on 1 May and during parts of 2 May showed the typical behavior seen in the basin, in this case with Echinus runoff producing repeated peaks with a range of 0.5-1.7 hours and a mean of ~1.1 hours. Ignoring the interval where the Echinus data became masked by the much larger Steamboat peak, the weir data on 2 May was similarly dominated by Echinus runoff; in this case showing peaks with a range of 0.5-3 hours and a mean of ~1.1 hours. The strong 2 May discharge at Steamboat furnished runoff that arrived at the weir at about 0520 (figure 7). Friedman estimated that the travel time for water from Steamboat to the measuring weir to be about 20 to 30 minutes, so the outburst must have occurred at about 0500. Within the limitations of the instrumental data at the weir, the discharge reached its apex at 0600. The water phase of the outburst lasted 40 to 60 minutes, reaching a recorded peak discharge rate of ~10 m3 per minute. The total amount of water discharged during the outburst can be calculated, giving a minimum estimate of the discharge during the outburst. The calculation was made using the area under the curve from the assumed base flow (figure 7). In addition, figure 7 shows how Friedman broke the Steamboat outburst into a water-dominated phase and a later steam-dominated phase. For the water phase, the weir discharged ~150 m3 (150,000 Liters); for the steam-phase, ~36 m3 (36,000 ,. In addition to the measured runoff, a large, but unknown amount of steam and condensate escaped into the atmosphere; other losses included water stored in places such as soil, ponded on the surface, etc. Friedman also discusses several representative day-long intervals of weir data, such as 21 September 1998, a day when small but regular peaks of ~0.4 m3/s occurred almost hourly, caused by the outbursts at Echinus geyser. Similar, though less regular patterns persisted in some of the later data. Unfortunately, an electrical connection corroded and broke electrical continuity, halting data collection during the interval early February-May 1999. During this interval without instrumental record, changes occurred at Norris: a) approximately 1 km from Echinus a new thermal area emerged; b) Echinus's period between outbursts became less regular; and c) the outbursts varied in duration and size, sometimes becoming absent from the record. It is possible that this emergent thermal area robbed Echinus of some of its water and heat. How or whether this helped drive Steamboat towards its 2 May outburst remains uncertain. Collateral observations. NPS literature states that Cistern Spring's water supply has been closely associated with Steamboat geyser: "When Steamboat erupts, Cistern Spring slowly drains." This pattern prevailed in the 2 May outburst. At 1100 on 2 May the surface water in Cistern Spring was ~8 cm below overflow. By 1900 on 2 May, it had dropped by 1.2 m. By 0900 on 3 May, Cistern Spring was empty; a photo around that time showed Steamboat's continuing steam phase with a plume tens of meters tall. In reporting recent geyser news on the Geyser Observation and Study Association (GOSA) web page, Paul Strasser noted that eight days prior to the minor outbursts, water gushed mainly from Steamboat's S vent, but occasionally gushed at its N vent, a pattern similar to the mode of activity seen last year. Strasser also noted some possible precursory effects. After the outburst, visitors allegedly told NPS staff that on 29 and 30 April they had seen water from both vents reaching 12-18 m high and felt a larger outburst might start. Naturalist John Tebby told Strasser that on 1 May he saw the minor discharges starting from both of Steamboat's vents, but only to ~2 m high; a modest amount of runoff came from the S vent. He was only in the vicinity for a short time. Intriguingly, Cistern Spring was then in heavy boil to depths of 15-20 cm, apparently having heated up. Background. The following comes from GOSA's descriptive list of Yellowstone's 182 geysers: "Steamboat Geyser is currently the tallest geyser in the world. Its major eruptions [discharges] can soar to nearly 400 feet [120 m]. Unfortunately, its major eruptions [discharges] are rare and erratic. Intervals between majors have ranged from 4 days to 50 years. More common is its minor activity that consists of splashes or small discharges every few minutes. This minor play can reach 30 feet [9 m] or more." "Steamboat is a cone-type geyser erupting [discharging] from two main vents. The water phase of a major eruption [outburst] lasts from 3 to 20 minutes and is followed by an extremely loud steam phase that can continue for another 12 hours. The water phase emits a large amount of water. The aftermath of which can easily be seen around the geyser . . . [sound intensity] of the steam phase has been described as painful . . . [audible] miles away." According to the Yellowstone Public Affairs office, Steamboat was dormant from 1911-1961. In recent years, Steamboat has had major discharges in 1989 (three events), 1990 (one event), and 1991 (one event). Strasser discusses how during 1982-84 Steamboat produced numerous short-interval minor discharges, whereas during 1979 only one outburst took place. Strasser and others (1989) cite more references than shown here. References. Whittlesey, Lee, 2000, Full steam ahead: Steamboat Geyser erupts! : The Buffalo Chip (a Yellowstone National Park employee resource-management newsletter) (Spring, 2000). Strasser, P., Strasser, S., and Pulliam, B., 1989, Investigations of patterns of minor behavior of Steamboat geyser, 1982-1984: Geyer Observation and Study Association Transactions, v. 2, p. 43-70 (see GOSA website). White, D.E., Hutchinson, R.A., and Smith, T.E.C., 1988, The geology and remarkable thermal activity of Norris Geyser Basin, Yellowstone National Park, Wyoming: U.S. Geological Survey Professional Paper 1456, U.S. Government Printing Office. Information Contacts: Bob Lindstrom and Ann Rodman, Yellowstone National Park, Wyoming 82190 USA; Irving Friedman, U.S. Geological Survey, P.O. Box 25046, MS 963, Denver, CO 80225 USA; Geyser Observation and Study Association (GOSA), care of Janet & Udo Freund, 39237 Yellowstone St., Palmdale, CA 93551 USA (URL: http://www.geyserstudy.org/). Yellowstone National Park press releases indicated unusual hydrothermal activity at the Norris geyser basin in the NW-central portion of the Park. A press release on 22 July 2003 announced that high ground temperatures and increased thermal activity had resulted in the temporary closure of a portion of the Back Basin. The press release noted "Norris is the hottest and most seismically active geyser basin in Yellowstone. Recent activity in the Norris geyser basin has included formation of new mud pots, an eruption of Porkchop geyser (dormant since 1989), the draining of several geysers, creating steam vents and significantly increased measured ground temperatures (up to 200°F [93°C]). Additional observations include vegetation dying due to thermal activity and the changing of several geysers' eruption intervals. Vixen geyser has become more frequent and Echinus geyser has become more regular." A press release on 7 August advised of a hydrothermal monitoring program by the Yellowstone Volcano Observatory to begin at Norris geyser basin. The Observatory is a collaborative partnership between the US Geological Survey, the University of Utah, and Yellowstone National Park. It was deploying a temporary network of seismographs, Global Positioning System receivers, and temperature loggers. Goals included identification of hydrothermal steam sources, the relationship of the behavior of Norris geyser basin to the general seismicity, and locating crustal deformation in the caldera. Information Contacts: Yellowstone Volcano Observatory, a cooperative arrangement that includesRobert L. Christiansen, U.S. Geological Survey, 345 Middlefield Road, Menlo Park, CA 94025; Robert B. Smith, Department of Geology and Geophysics, University of Utah, Salt Lake City, Utah 84112 USA; Henry Heasler, National Park Service, P.O. Box 168, Yellowstone National Park, WY 82190-0168 USA; and others (URL: https://volcanoes.usgs.gov/observatories/yvo/). According to the Yellowstone Volcano Observatory (YVO), during February 2006 there was relatively low seismicity, with 82 reported earthquakes in the region. The largest of these was on 25 February, M 3.1, located near the N caldera rim (~ 10 km SSW of Canyon Junction). None of these earthquakes were reported as felt. Our previous report discussed elevated temperatures of the ground and increased hydrothermal effects at Norris hot springs in 2003 (BGVN 28:07). Norris also represents a frequent epicentral area for earthquakes inside the caldera. In 2002, for example, there were more than 2,350 earthquakes detected at Yellowstone, including over 500 triggered by the November 2002, M 7.9 Denali earthquake. Seismicity during April 2005-April 2006 was comparatively low. Figure 8 plots quarterly earthquakes (≥ M 1.5) during 1974-2004 on a histogram. Figure 9 depicts earthquake swarms during 1985, 1995, and 2004. Figure 8. A plot of recorded earthquakes (≥ M 1.5) at Yellowstone from 1974 through 2004 (bars, left-hand scale: each bar represents the sum of the earthquakes of stated size per quarter (~ 90 days)). The curving solid line shows the cumulative number of earthquakes for the thirty-year period (right-hand scale). Estimates of mean caldera uplift and subsidence are shown as a dashed-and-dotted line with no scale. Note that this figure stopped in 2004 and does not depict some of the stronger deformation seen in radar and later GPS data (discussed below). Courtesy of YVO (after a figure by Waite and Smith, 2002). Figure 9. A map of Yellowstone caldera and National Park with circles indicating located earthquakes (≥ M 1.5) from the swarm of 1985 (westerly cluster), 1995 (easterly cluster with substantial events inside the caldera), and 2004 (smaller cluster to the N of the other two). Courtesy of YVO. 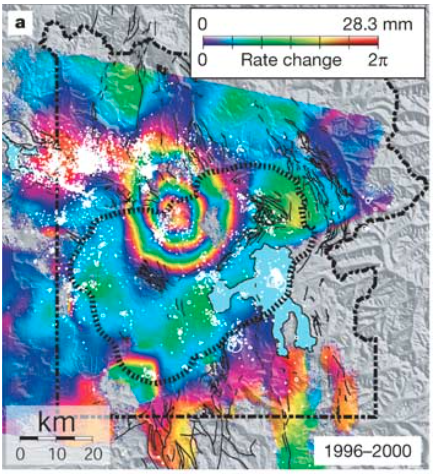 Satellite radar created an interferogram of the caldera region (basically, a depiction of the vertical offset determined by satellite radar during 1996-2000). 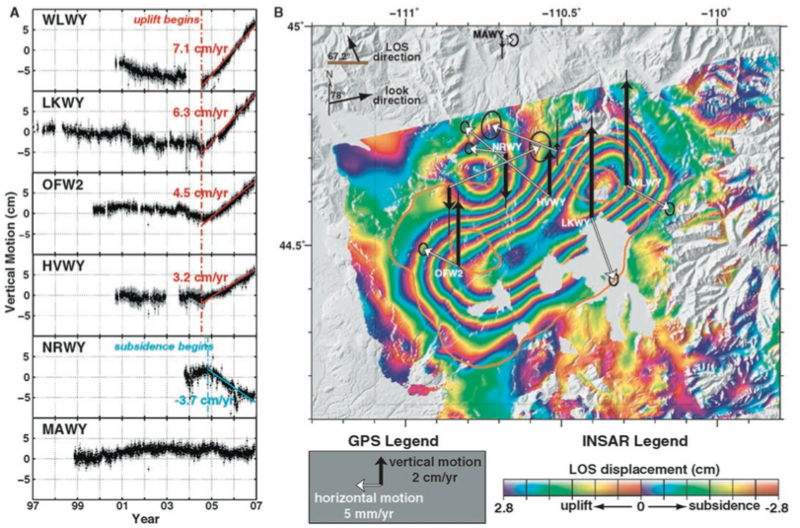 The interferogram portrayed vertical displacement as a large bull's-eye shape (figure 10), and indicated 12.5 cm of uplift centered in the northern portion of the caldera ~ 25 km NW of Yellowstone Lake. Figure 10. A radar interferogram of the Yellowstone caldera region (after Wicks and others, 1998; 2006). This image of vertical ground deformation was created using data from several satellite passes during 1996 through 2000. The image shows 12.5 cm of uplift centered within the northern end of Yellowstone caldera (black dotted line), about 10 km S of Norris hot springs. Each full spectrum of color (from red to purple) represents ~ 28 mm of uplift. The area of uplift is approximately 35 km x 40 km in size. Courtesy of YVO-USGS. 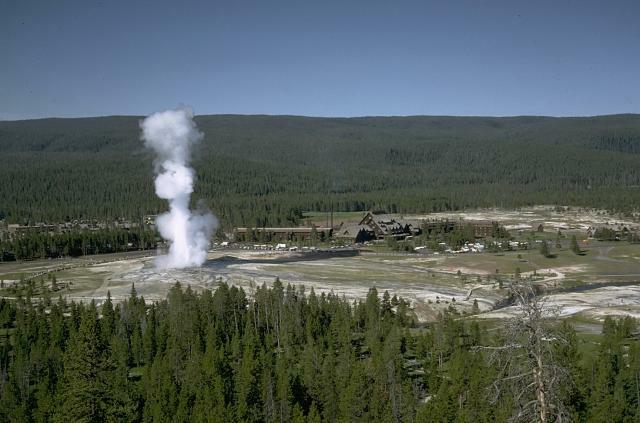 In response to increased heat and steam emissions in parts of Norris geyser basin, a temporary, five-station GPS network was installed in that area in 2003. The network was installed by a UNAVCO engineer, University of Utah students and faculty, and National Park Service scientists as part of a monitoring effort by YVO. Permanent station NRWY currently resides there (figure 11). Figure 11. GPS stations at Yellowstone caldera, including those both existing (light triangles) and planned (dark triangles). The irregular loops near stations OFW2 and WLWY outline the two active resurgent domes within the 0.64 million-year-old Yellowstone caldera (the Mallard Lake dome and the Sour Creek dome, to the W and E, respectively). The figure also includes Yellowstone caldera topographic margins (T), Yellowstone Lake (L), the National Park boundary (PB), and some state boundaries. Courtesy of YVO-USGS. Movement near the N end of Yellowstone Lake was measured by GPS at station LKWY during 1997 to late 2005 (figure 12). The N-S movement (top panel) shown in the past year consisted of displacement of 10-15 mm southward. This N-S movement was somewhat stronger and more protracted than in the earlier parts of the GPS data. The E-W movement (middle panel) was comparatively steady and unbroken over the past 6 years or more, directed westward. Over the past 9 years, the overall E-W motion was ~ 15 mm westward. The vertical motion (lower panel) was negative (subsidence) during 1997 to mid-2004. After that, station LKWY moved sharply upward, rising ~ 80 mm in the last year and a half. Caldera systems frequently undergo ground displacements similar to those observed at Yellowstone without progressing to eruptive activity. Figure 12. Relative movement of GPS station LKWY (located in the central part of the caldera, at the N end of Yellowstone Lake) recorded during 1997 to late 2005. The top panel shows N-S movement, the middle, E-W movement, and the bottom, vertical movement. During 2001-2004 station LKSY moved downward (subsided) on the order of 20 mm. After mid-2004, LKWY moved upward ~ 80 mm. Courtesy of YVO-USGS. Much of the history of older calderas that preceded Yellowstone are buried in the subsurface to the W, and a drilling proposal for that region is under development. "Hotspot," the Snake River Scientific Drilling Project, announced an inter-disciplinary workshop with that goal, to be held 18-21 May 2006 and focused on issues central to a new intermediate-depth drilling program in the Snake River Plain of S Idaho, USA. That region provides a record of inferred mantle plume volcanism in an intra-continental setting. Because it is young and tectonically undisturbed, the complete record of volcanic activity can be sampled only by drilling. The preliminary plan was to drill and core 4-6 holes along the axis of the E and W Snake River Plain. References. Wicks, C., Thatcher, W., and Dzurisin, D., 1998, Migration of fluids beneath Yellowstone Caldera inferred from satellite radar interferometry: Science, v. 282, p. 458-462. Wicks, C., Thatcher, W., Dzurisin, D., and Svarc, J., 2006 (in press), Uplift, thermal unrest, and magma intrusion at Yellowstone Caldera, observed with InSAR: Nature. Information Contacts: Yellowstone Volcano Observatory, a cooperative arrangement that includesJacob B. Lowenstern, U.S. Geological Survey, 345 Middlefield Road, Menlo Park, CA 94025, USA; Robert B. Smith, Department of Geology and Geophysics, University of Utah, Salt Lake City, UT 84112, USA; Henry Heasler, National Park Service, P.O. Box 168, Yellowstone National Park, WY 82190-0168, USA (URL: http://volcanoes.usgs.gov/yvo/). The Yellowstone Plateau volcanic field developed through three volcanic cycles spanning two million years that included some of the world's largest known eruptions. Eruption of the over 2450 km3 Huckleberry Ridge Tuff about 2.1 million years ago created the more than 75-km-long Island Park caldera. The second cycle concluded with the eruption of the Mesa Falls Tuff around 1.3 million years ago, forming the 16-km-wide Henrys Fork caldera at the western end of the first caldera. 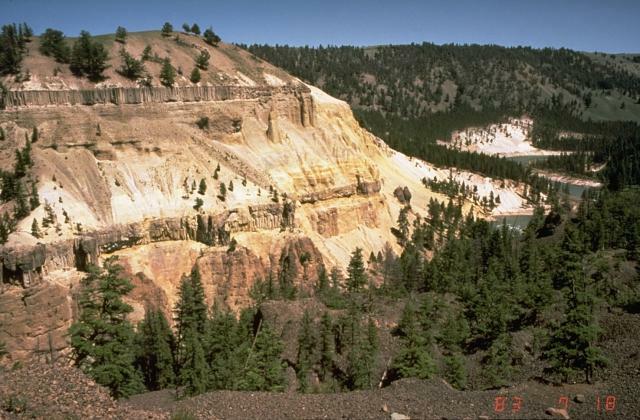 Activity subsequently shifted to the present Yellowstone Plateau and culminated 640,000 years ago with the eruption of the over 1000 km3 Lava Creek Tuff and the formation of the present 45 x 85 km caldera. Resurgent doming subsequently occurred at both the NE and SW sides of the caldera and voluminous (1000 km3) intracaldera rhyolitic lava flows were erupted between 150,000 and 70,000 years ago. No magmatic eruptions have occurred since the late Pleistocene, but large hydrothermal eruptions took place near Yellowstone Lake during the Holocene. Yellowstone is presently the site of one of the world's largest hydrothermal systems including Earth's largest concentration of geysers. This volcano is located within the Yellowstone National Park, a UNESCO World Heritage property. Christiansen R L, 1984. Yellowstone magmatic evolution: its bearing on understanding large-volume explosive volcanism. In: Explosive Volcanism: Inception, Evolution, and Hazards, Washington, D C: Natl Acad Press, p 84-95. Christiansen R L, 2001. The Quaternary and Pliocene Yellowstone Volcanic Field of Wyoming, Idaho, and Montana. U S Geol Surv Prof Pap, 729-G: 1-145. Christiansen R L, Lowenstern J B, Smith R B, Heasler H, Morgan L A, Nathenson M, Mastin L G, Muffler L J P, Robinson J E, 2007. Preliminary assessment of volcanic and hydrothermal hazards in Yellowstone National Park and vicinity. U S Geol Surv, Open-File Rpt, 2007-1071: 1-94. Dzurisin D, Yamashita K M, Kleinman J K, 1994. Mechanism of crustal uplift and subsidence at the Yellowstone caldea, Wyoming. Bull Volcanol, 56: 261-270. Finn C A, Morgan L A, 2002. High-resolution aeromagnetic mapping of volcanic terrain, Yellowstone National Park. J. Volcanol. Geotherm. Res., 115: 207-231. Fournier R O, Christiansen R L, Hutchinson R A, Pierce K L, 1994. A field-trip guide to Yellowstone National Park, Wyoming, Montana, and Idaho-volcanic, hydrothermal, and glacial activity in the region. U S Geol Surv Bull, 2099: 1-46. Hildreth W, Christiansen R L, O'Neal J R, 1984. Catastrophic isotopic modification of rhyolitic magma at times of caldera subsidence, Yellowstone Plateau volcanic field. J. Geophys. Res, 89: 8339-8369. Hutchinson R A, Westphal J A, Kieffer S W, 1997. In situ observations of Old Faithful Geyser. Geology, 25: 875-878. Morgan L A, Shanks W C III, Lovalvo D A, Johnson S Y, Stephenson W J, Pierce K L, Harlan S S, Finn C A, Lee G, Webring M, Schulze B, Duhn J, Sweeney R, Balistrieri L, 2003. Exploration and discovery in Yellowstone Lake: results from high-resolution sonar imaging, seismic reflection profiling, and submersible studies. J. Volcanol. Geotherm. Res., 122: 221-242. Pierce K L, Cannon K P, Meyer G A, Trebesch M J, Watts R D, 2002. Post-glacial inflation-deflation cycles, tilting, and faulting in the Yellowstone caldera based on Yellowstone Lake shorelines. U S Geol Surv Open-File Rpt, 02-0142: 1-62. Smith R B, Braile L W, 1984. Crustal structure and evolution of an explosive silicic volcanic system at Yellowstone National Park. In: Explosive Volcanism: Inception, Evolution, and Hazards, Washington D C: Nat Acad Press, p 96-109. Smith R B, Braile L W, 1994. The Yellowstone hotspot. J. Volcanol. Geotherm. Res., 61: 121-187. Smith R B, Braile L W, 1993. Topographic signature, space-time evolution, and physical properties of the Yellowstone-Snake River Plain volcanic system: the Yellowstone hotspot. In: Snoke A W, Steidtmann J R, Roberts S M (eds), Geology of Wyoming, Geol Surv Wyoming Mem: 5: 694-754. Smith R B, Siegel L J, 2000. Windows into the Earth: The Geologic Story of Yellowstone and Grand Teton National Parks. Oxford: Oxford Univ Press, 242 p.
Waring G A, Blankenship R R, Bentall R, 1965. Thermal springs of the United States and other countries of the world, a summary. U S Geol Surv Prof Pap, 492: 1-383. Remarks: Broad caldera-wide uplift at high rates from 2004 to 2006 and lower rates from 2006 to 2009. (A) Temporal variation of vertical ground motions of labeled Yellowstone GPS stations. Each dot represents a daily position determination. Light gray bars are 1-s errors. Red and blue dot-dash lines mark the inceptions of the uplift and the subsidence, respectively. Deformation rates are the slopes of the interpolated lines. (B) A stacked InSAR interferogram (ENVISAT IS2 mode) from 22 September 2004 to 23 August 2006 overlain with averaged GPS velocities from 07 October 2004 and 07 October 2006. 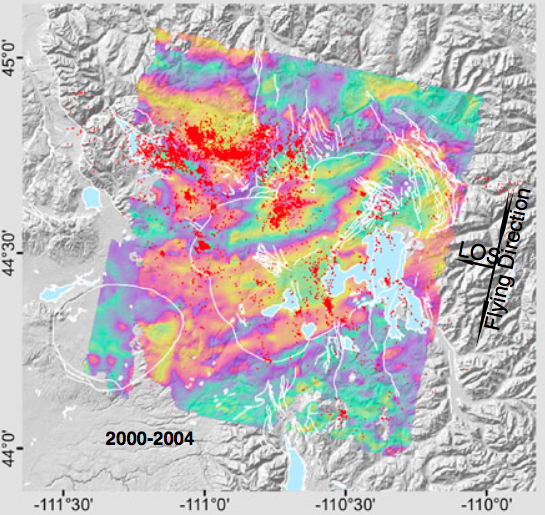 The line-of-sight (LOS) displacement of Earth?s surface toward the satellite from the interferogram infers a total uplift of about 11 cm in the west part of the caldera and as large as 15 cm at the Sour Creek resurgent dome and a subsidence of 6.6 cm near the Norris Geyser Basin. White and black arrows represent horizontal and vertical velocity vectors, respectively. Black ellipses and bars are scaled 2-s errors (11). From: Chang et al. 2007. Reference List: Chang et al. 2007; Chang et al. 2010; Aly and Cochran 2011. Chang, C.-P., J.-Y. Yen, A. Hooper, F.-M. Chou, Y.-A. Chen, C.-S. Hou, W.-C. Hung, and M. S. Lin,, 2010. Monitoring of surface deformation in northern Taiwan using DInSAR and PSInSAR techniques. Terr. Atmos. Ocean. Sci., Vol. 21, No. 3, 447-461. From: Aly and Cochran 2011. Reference List: Wicks et al. 2006; Vasco et al. 2007; Aly and Cochran 2011. Wicks, C., Thatcher, W., Dzurisin, D., and Svarc, J.,, 2006. Uplift, thermal unrest, and magma intrusion at Yellowstone caldera. Nature, v. 440, p. 72-75. A colour change from violet to blue to green to yellow to red marks an increase in the range (distance from the satellite to points on the ground) of 28.3 mm. The white circles represent epicentres of earthquakes recorded during the time interval spanned by each interferogram. The interferograms have been generated using European Space Agency ERS-2 data (see Supplementary Information) and the two-pass method of interferometry24. The extensive double dash length broken line in each panel shows the boundary of Yellowstone National Park. The short dash length broken line in each panel (within the park boundary) shows the approximate location of the 640,000-year-old caldera rim. a, Summer 1996 to summer 2000 interferogram. Although the caldera floor appears to have subsided only slightly, this period includes about 30 mm of caldera-wide uplift from 1996 to 1997 (ref. 4). Therefore, more than 30 mm of subsidence of the caldera floor occurred between the ML and SC resurgent domes (Fig. 1) from 1997 to 2000. From: Wicks et al. 2006. Reference List: Wicks et al. 2006; Vasco et al. 2007; Chang et al. 2007; Aly and Cochran 2011. (A) August 1992 to June 1993. This image shows over 30 mm of inferred subsidence centered in the northeast half of the caldera and closely associated with the SC dome. (B) June 1993 to August 1995. In this image, the center of deformation has shifted to the southwest half of the caldera with over 40 mm of subsidence associated with the ML dome. From: Wicks et al. 1998. Reference List: Wicks et al. 1998; Dzurisin et al. 1999; Wicks et al. 2006; Vasco et al. 2007; Chang et al. 2007; Aly and Cochran 2011. Dzurisin, D., Wicks, C.J., Jr., and Thatcher, W.,, 1999. Renewed uplift at the Yellowstone caldera measured by leveling surveys and satellite radar interferometry. Bulletin of Volcanology, v. 61, p. 349-355. Wicks, C., Thatcher, W., and Dzurisin, D,, 1998. Migration of fluids beneath Yellowstone Caldera inferred from satellite radar interferometry. Science, 282: 458-462. There is no Emissions History data available for Yellowstone. The terraces of Mammoth Hot Springs in NW Yellowstone consist of shallow pools with ledges draped with ribbons of travertine. Rapid deposition encroaches on nearby forests and can produce changes visible within a period of weeks. Photo by Lee Siebert, 1968 (Smithsonian Institution). An eruption of Old Faithful, perhaps the world's best known geyser, rises above Yellowstone's Upper Geyser Basin. Old Faithful is a periodic geyser, with eruptions to heights of about 40 m at intervals of 30 to 100 minutes. Old Faithful Lodge to the right provides a rustic backdrop to the Upper Geyser Basin, which contains more geysers than are known altogether in the rest of the world. 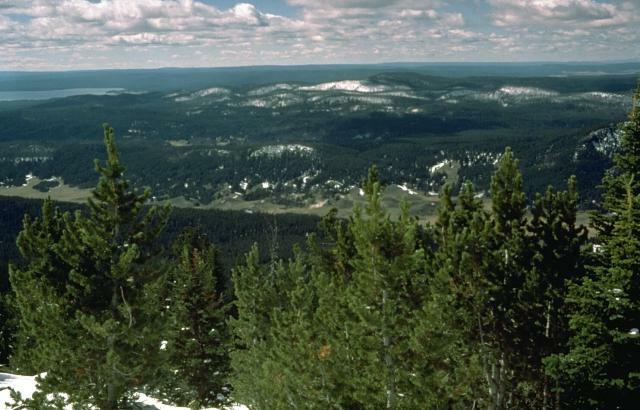 The forested ridge in the background is underlain by massive post-caldera rhyolitic lava flows of the Madison Plateau. 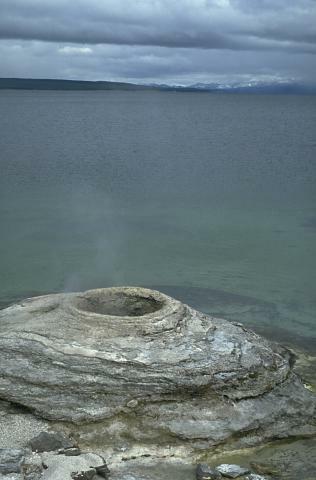 The West Thumb Geyser Basin at the SW end of Yellowstone Lake contains thermal features, such as this sinter mound, both above and below the lake shore. 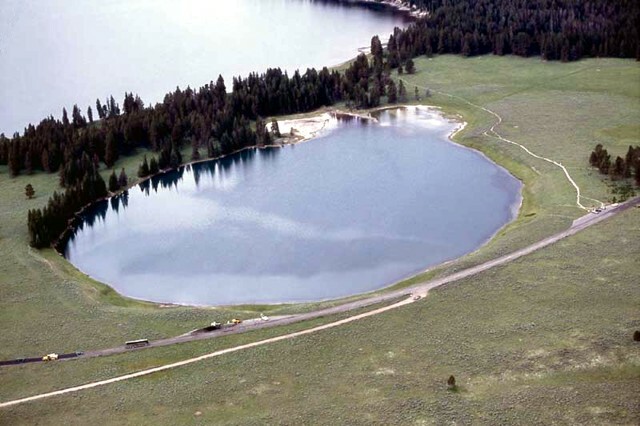 The West Thumb embayment of Yellowstone Lake is a smaller caldera that formed as a result of an explosive eruption during a period of mainly lava-producing eruptions during the past 150,000 years. Photo by Lee Siebert, 1994 (Smithsonian Institution). The thick cliffs are composed of massive ash-flow deposits of the Lava Creek Tuff, erupted about 640,000 years ago. 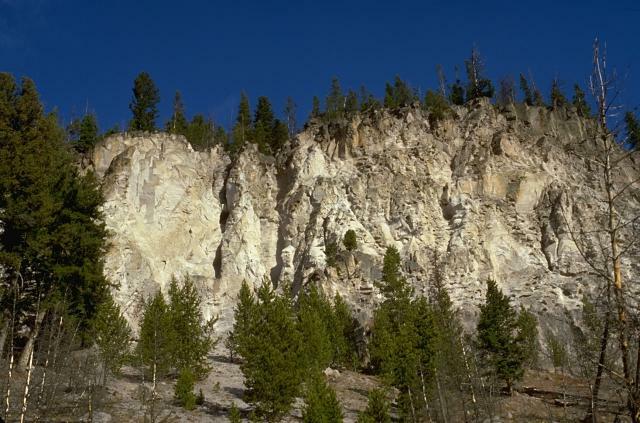 Eruption of the 1000 cu km Lava Creek Tuff resulted in the formation of the present 45 x 85 km wide caldera, the latest of three large calderas formed at Yellowstone during the past 2 million years. The Mesa Falls Tuff is exposed in a quarry wall near Ashton, Idaho that shows light-colored airfall and pyroclastic-surge deposits overlain by orange-colored pyroclastic-flow deposits. The 280 cu km Mesa Falls Tuff, deposited about 1.3 million years ago during the second of Yellowstone's three largest eruptions, resulted in the formation of the 16-km-wide Henrys Fork caldera west of Yellowstone National Park. A small mudpot vent in Pocket Basin at the north end of Yellowstone's Lower Geyser Basin produced this intriguing feature that mimics a spatter cone that issued a lava flow. Mudpots form in areas of intense, clay-rich hydrothermal alteration where the thermal system is dominated by the gas phase. Photo by Dan Dzurisin, 1983 (U.S. Geological Survey). The two dark horizontal bands in the cliff on the left near Tower Junction in NE Yellowstone are lava flows that display prominent columnar jointing. The base of the cliff exposes volcanic materials of the Absaroka Formation. The light-colored rocks between the basaltic lava flows are stream-gravel sediments. The top of the hill consists of lake sediments. The tip of Yellowstone Lake is seen at the upper left from Pelican Cone near the NE rim of Yellowstone caldera. The forested, snow-capped peaks in the center are rocks of the Sour Creek resurgent dome, an area of uplifted and faulted post-caldera rocks. Photo by Dzurisin, 1985 (U.S. Geological Survey). 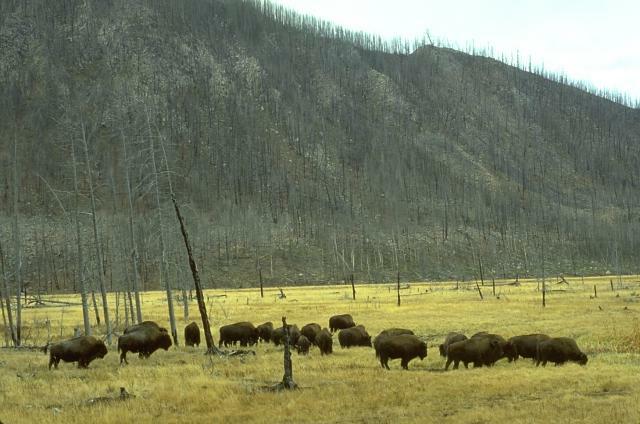 Bison graze in a meadow along the Madison River in front of rocks of the massive West Yellowstone lava flow that are visible in the cliff behind them as a result of the 1988 Yellowstone fires. 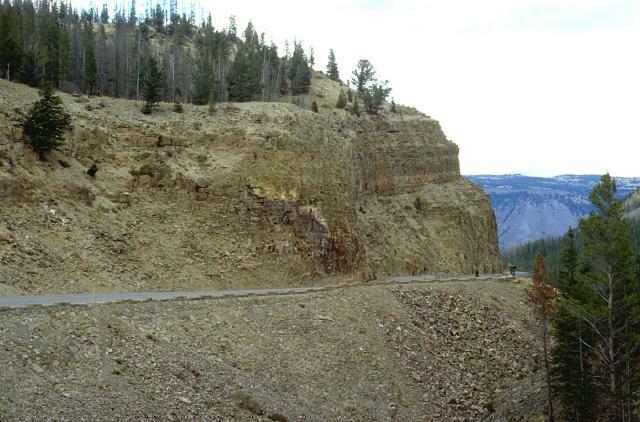 A roadcut at Golden Gate, north of Mammoth, cuts through the Huckleberry Ridge Tuff, the deposit produced by the gigantic eruption that created Yellowstone's first caldera about 2 million years ago. The 2500 cu km Huckleberry Tuff, one of the world's largest Quaternary eruptions, consists of welded tuffs and voluminous airfall deposits found as far away as southern California. The eruption created the 75-km-wide Island Park caldera, which extends from SE-Idaho into central Yellowstone. Riverside Geyser in the Upper Geyser Basin is the most regular of Yellowstone's geysers. Every six hours it erupts a 25-m-high inclined jet from a small vent hole on the east bank of the Firehole River 2 km downstream from Old Faithful. 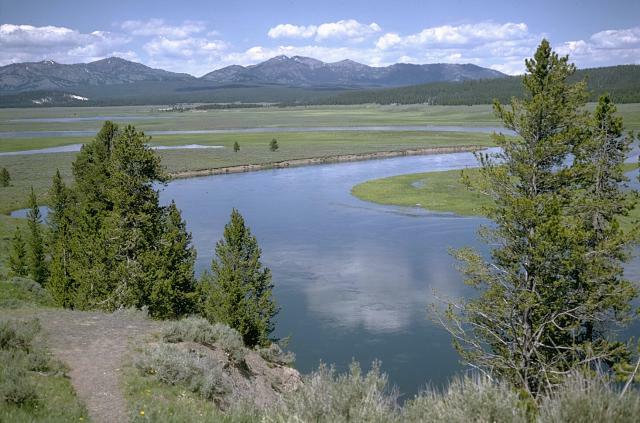 The Yellowstone River slowly meanders through the Hayden Valley, which is underlain by glacial lake sediments capping thick lava flows on the floor of Yellowstone caldera. Mount Washburn, in the center background, is part of an ancient Absaroka volcano that predates the caldera. The northern margin of the Yellowstone caldera lies at the base of the mountain range. Photo by Lee Siebert, 1974 (Smithsonian Institution). The 500-m-wide Indian Pond hydrothermal explosion crater immediately north of the NE shore of Yellowstone Lake formed about 3350 years ago. Deposits from this eruption extend 3 km from the crater and are up to 3-4 m thick. Yellowstone Lake is seen at the top, with the highway leading to Cody at the bottom in this aerial view from the NE. Photo by Jim Peaco, 2001 (National Park Service). The following 1256 samples associated with this volcano can be found in the Smithsonian's NMNH Department of Mineral Sciences collections, and may be availble for research (contact the Rock and Ore Collections Manager). Catalog number links will open a window with more information. Large Eruptions of Yellowstone Information about large Quaternary eruptions (VEI >= 4) is cataloged in the Large Magnitude Explosive Volcanic Eruptions (LaMEVE) database of the Volcano Global Risk Identification and Analysis Project (VOGRIPA).